Friendly and attentive staff, eight real ales on tap, quick service, excellent menu (food – locally sourced – seemingly served all day) and a chatty and quirky atmosphere make the Basketmakers Arms the perfect pub. The bar itself is U-shaped with 2 linked areas to drink and dine with comfortable benches and stools at round tables. The walls are adorned with tobacco tins, enamel signs and photographs. 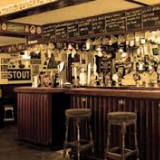 Its great to sit in this atmospheric local and have a few pints whilst chatting or catching up on the papers. The food is excellent, plentiful and at the same time very reasonably priced.